the pink clutch ...: Oh Happy Spring! I am literally giddy this morning knowing that spring is here. There may be a little nip in the air, but the blue sky and the sun shining has me filled with inspiration and dreaming of so many things that I want to do this spring. Even though Winter isn't my favorite season it usually doesn't make me sad like this one did. It was grey so many of the days and the rain was literally unending. I can not tell you how much moss we have in our yard and it almost felt as if it was growing on me as well. I love a good rain storm, especially at night, but rain all day every day is honestly just awful. The upside to the rain is all the beautiful green (even moss) that we have now and the trees in bloom and the tulips which are just beginning to show their pretty little blooms. I can not say it enough ... happy spring! To celebrate spring at our home I removed our normal green wreath and added this amazing basket from Audrey Durden. I love that it is deep enough to add flowers and has a darling little plaque with our house number on it. I knew immediately when it arrived I wanted to fill it with flowers to greet all our friends when they pop over. Initially I was thinking of using tulips until learning of Dollar Hydrangea from my friend Natalie who posted about them on Instagram. 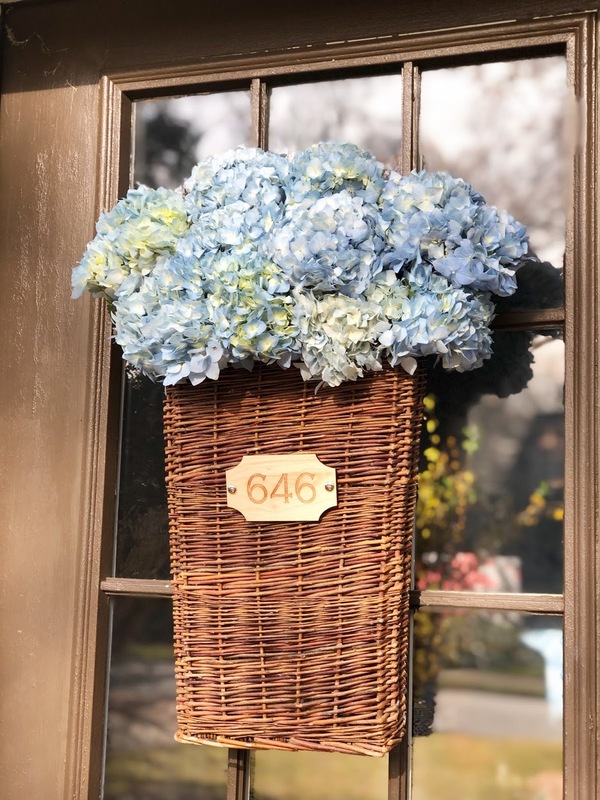 I love hydrangeas and I was thrilled to learn you can buy them wholesale and have them arrive on your doorstep the day you need them. I immediately got online, purchased 40 blue ones and planned out how it would look hanging on our door. The blooms arrived yesterday morning via FedEx and I was utterly thrilled with the shipment. They were packed beautifully with bags of water on each stem. After taking each bloom out of its bag I was able to fluff it and use it immediately. The blooms are so large, each one larger than my hand, which created a stunning arrangement for the door. I only used 10 of the 40 in the box for the basket leaving 30 for vases. 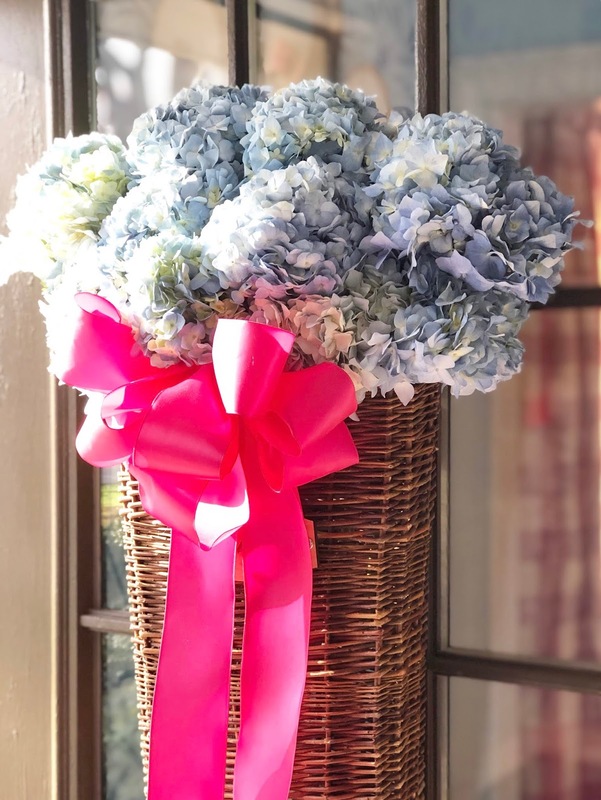 I was able to create four large vases that are overflowing with the most beautiful hydrangeas. I can not wait to see two of them on a table I am shooting on Friday. They will most definitely steal the show. 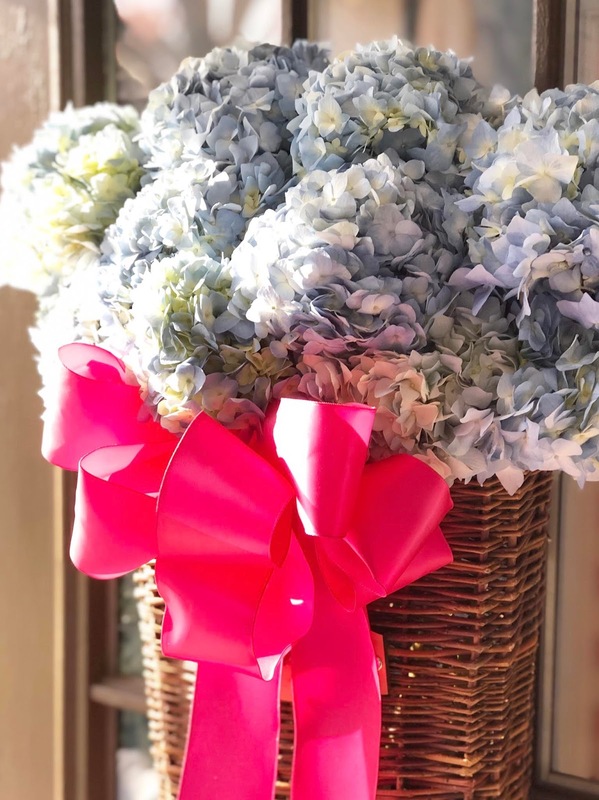 At the last moment before I shut the front door with my new arrangement I decided the basket would look even better with a bow so I used the pink one I had added to our green wreath for Valentines Day. 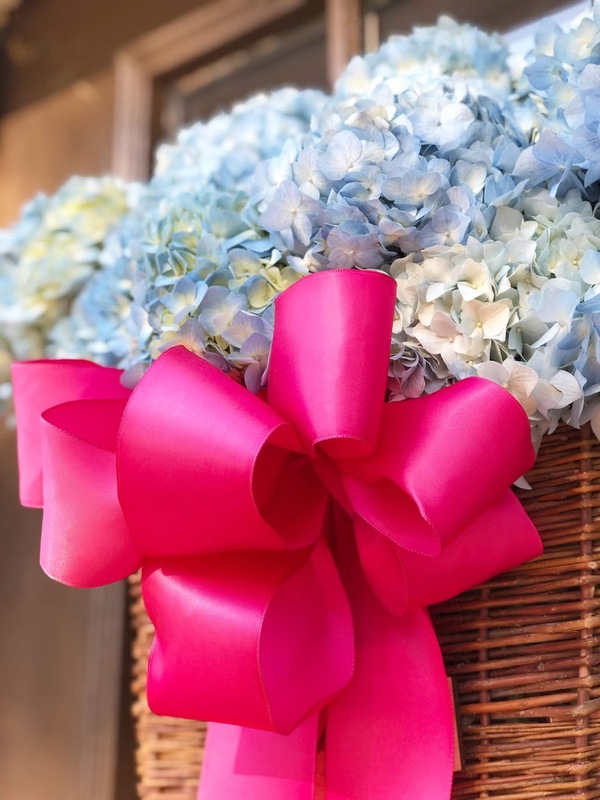 The bow makes the whole thing even better and the sun shining on the pink with the stunning blooms made my whole day. Driving home after lacrosse last night it was the first thing I spotted and I was truly thrilled. Spring is here and my house may have a layer of winter dust on everything inside, but outside it is truly perfect. I cannot recommend Dollar Hydrangea enough. 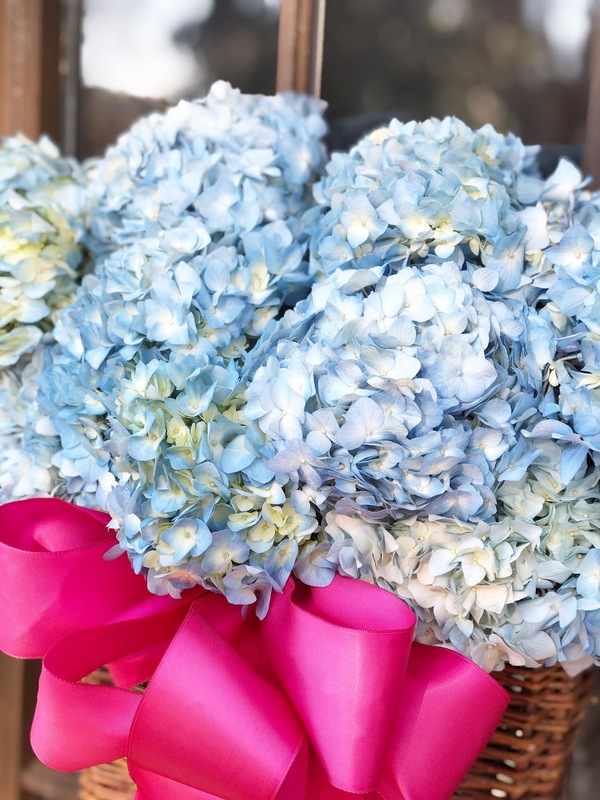 You must order some blooms for yourself and most definitely for any special occasion or party you have. There is a minimum of 40 blooms, but you can divide up the order with more than one color, and the shipping is FREE! Simply add in the number of each you would like in the notes box and you are good to go. I requested to have mine delivered on Monday and the lovely people requested to ship them to arrive Tuesday which worked out perfectly for me. The girl was darling on email and so kind when she made her request, just the way I like my sources, super easy to worth with and great customer service! Stop what you are doing and order a basket for yourself, one for your best friend and one for your mother for Mother's Day. You will be so thankful you did! How long do they stay fresh in the basket on the door? Update, They came & are gorgeous!!! Had to hustle to meet a delivery deadline. All & all will keep using however will make delivery earlier from delivery dates. THX for the lead.